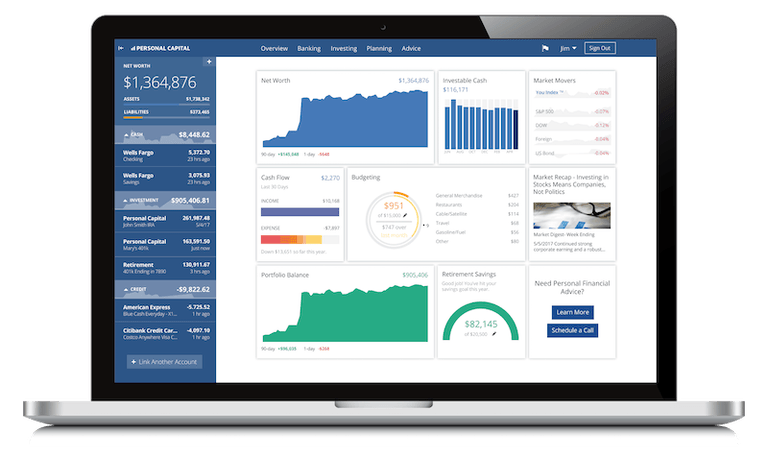 Personal Capital offers a free financial management tool. Whether you’re looking at different ways to finance a log home or applying for a mortgage or needing log home insurance, one of the most important things you can do to help that process is to get your financial affairs organized. If you’re like me you have bank accounts, both checking and savings, maybe a couple of different investment accounts, multiple credit cards, a mortgage and possibly other debts. How do you keep track of all these separate accounts? More importantly, how can you get a clear overview of your financial situation, especially the most important number for your financial health: your net worth? I was looking for something that would provide me with a high-level overview of all of my income, expenses, net worth and account balances with one login. For years I tracked all of this manually by logging into each account online and looking up the current value of the asset or the remaining debt. I plotted all of these numbers into a spreadsheet and studied it to try and grasp the underlying situation: how was I doing month-to-month? Were things getting better or worse, or was I just treading water? Even harder was trying to project into the future, asking myself when debts would get paid off, how much would my investments grow, where would I be in a year or in five years. how net worth has increased over time. what bills are coming due. how much my retirement accounts are charging for fees. what is my outlook for projected long-term retirement, based on a 5000-scenario Monte Carlo simulation. 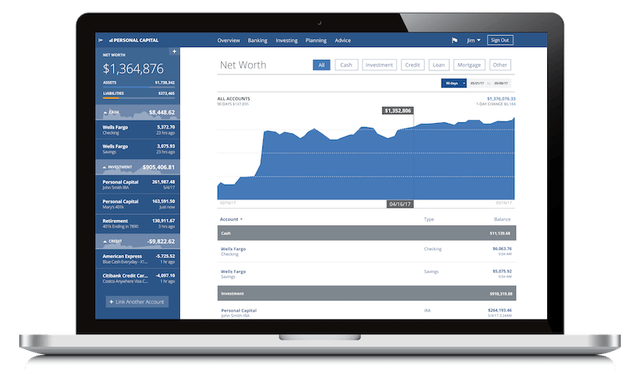 I now use Personal Capital for tracking all of my financial assets and liabilities and with one login I can see everything at a glance. All of my accounts are linked in one place and are updated in real time. Instead of accounts all over the place, they all appear in one neat summary. Don’t they have to make money somehow? Personal Capital makes its money by managing accounts for people who don’t want to do it on their own. 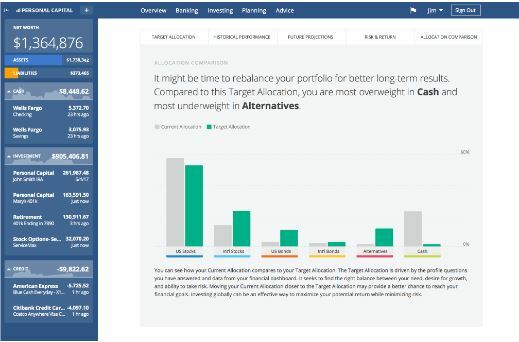 For a fraction of a percent, they will maintain a balanced asset allocation and even handle tax-loss harvesting to cut down on taxes you may owe at year-end. The amount that PC charges is actually a pretty good deal compared to traditional financial advisors. But if you don’t want their help and prefer to handle your own investments - like I do - you can politely decline and they won’t bother you again. I love logging in to see my investment income growing steadily, aggregated in one place. I can see which investments are doing well and which are lagging. I can drill down into each account to see my exact asset allocation and compare it to investment indices like the S&P 500 or the DJIA. Personal Capital makes it easy to click into each fund or account and see its performance over the last 30 days, 90 days, YTD or whatever custom date range I choose. 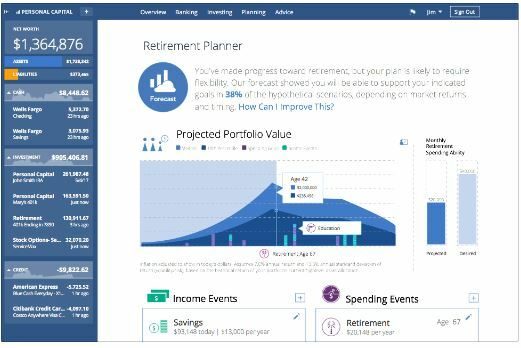 One of the unique benefits that PC offers is evaluation of the fees charged on your 401(k) account. These fees notoriously hard to find, buried deep in the small print, and most people never know how much they’re losing over time to multiple fees on their tax-deferred accounts. 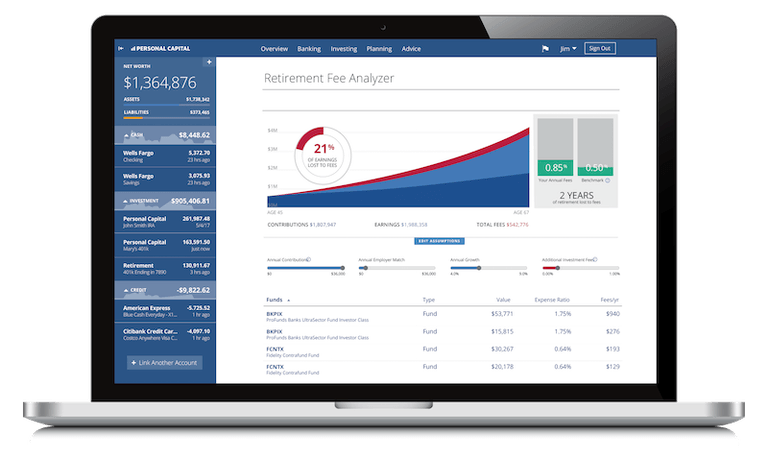 Personal Capital digs deep and graphically displays not only the fees themselves, but also how much you will lose to fees over your working lifetime, and how many years of retirement that represents. It’s sobering stuff and makes you reevaluate fund choices. I went back to my 401(k) and changed my fund choices based partly on elevated fees that I was paying. 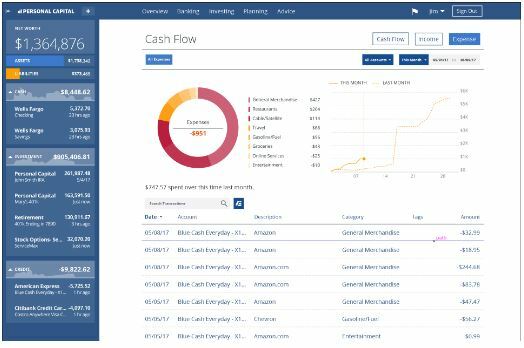 In addition to monthly cash flow, income and expenses, Personal Capital displays upcoming bills so you can see what is due when and ensure that you have the funds allocated to pay the bills. You may think it’s no big deal to miss a payment here and there, but your credit score will suffer and, as a result, you will pay more for a log home mortgage you may be seeking. When you set up a meeting with a loan officer for a mortgage for your log home or a construction loan to build a log cabin, there’s a huge benefit to being able to print out colorful, professional graphs and hard numbers documenting your solid financial footing. Being organized, efficient and knowledgeable about your entire financial picture shows that you’re on top of your finances and represent a good risk to your log home lender. When you sign up with Personal Capital you link your financial accounts by providing the login details for each account online. This is daunting at first and made me hesitate before providing this very personal and valuable information. After digging deeper I came to realize that Personal Capital uses stronger encryption than most of the online banks and credit cards use, including multiple layers of security. They also have strict internal access controls such that no individual at PC has access to your credentials. It’s held in secret and they can’t see it from their end. In fact, by following all your accounts and tracking each and every credit card transaction you can quickly identify and stop any unauthorized transaction that may occur. In the end, if you want to simplify your life and transform the visual picture you carry of your financial situation, you owe it to yourself to sign up with Personal Capital.